Some of you may have already seen one or two of the photos from this night that I posted on the Mike Isaak Photography page on Facebook. When checking Solarham.net earlier in the day, I noticed that the Bz was tipped sharply south. I also received a message from Curtis Reimer stating the same thing, but I was busy at home until about 11:30pm. After loading up my gear into the 4Runner, I headed to the Timmy’s I always go to near my place, only to discover it’s not open past midnight! I had to quickly find another one to get my coffee fix in, so I wouldn’t fall asleep on the drive home later! I eventually got onto the Anthony Henday ring road shortly after midnight, and really only had two options of where I was headed. I had looked at the Intellicast radar map to see what direction the clouds were headed before going out, and I knew I had to go east of the city. That left me with Yellowhead trail towards Elk Island Park and Mundare, and Highway 16 towards Tofield. I knew that I had to head east quick, because there was a storm heading due east, right for Edmonton and it would eventually cover both areas I was thinking of going to. So I chose the route that would take me east the quickest. I’m always looking for interesting compositions when shooting the aurora, and on that highway, I really only know the area of Cooking Lake. There was too much cloud cover and light pollution when I got close to the lake, so I kept driving. I had to find something interesting! 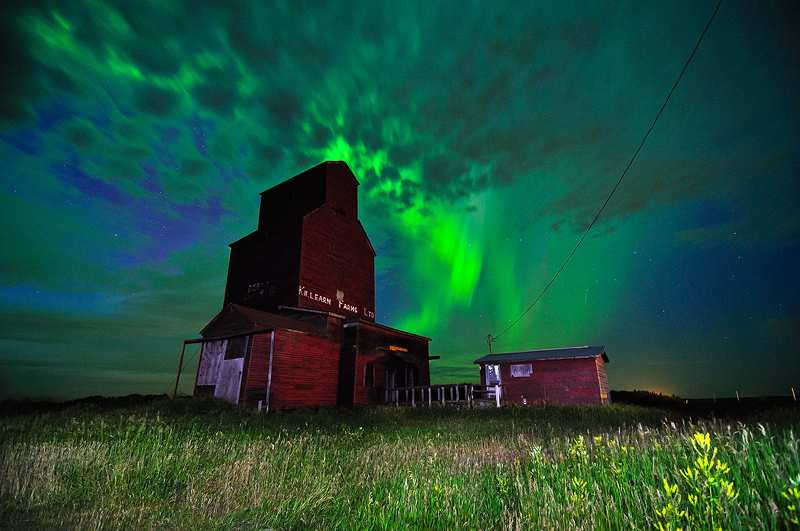 I’m always wanting to shoot northern lights with some kind of prairie icon in the foreground, whether it is old farm equipment, abandoned cars, or one of the last few remaining grain elevators. 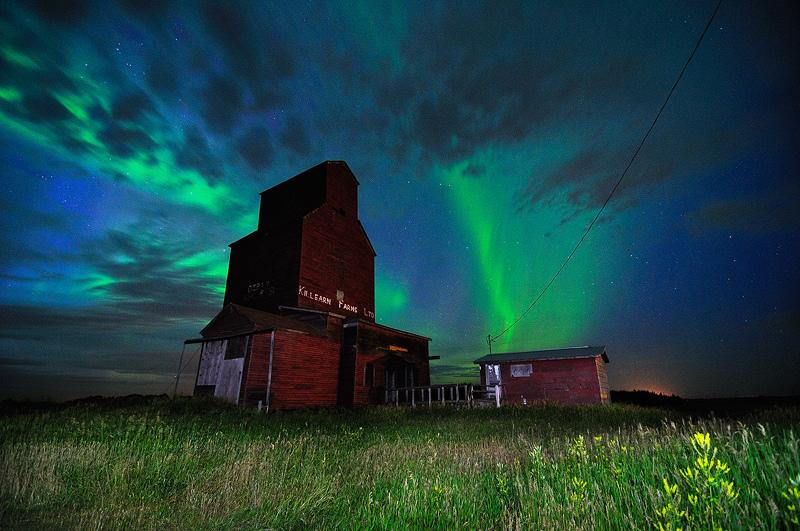 On my phone I did a Google image search for grain elevators in Tofield, and a picture of this grain elevator popped up. I had no idea where it was located, but one of the links had a map with the elevators position pinned. It’s about halfway between Tofield and Ryley, on the north side of the road. I drove as quickly as I could (within reason) and the farther east I went, the less clouds were to the north and east and I could see more and more green. I got close to the pinned location and slowed down so I could look for a dark blob on the left side of the road, and eventually found it right across the road from someones farmhouse. I could see how bright the aurora was and I still didn’t have a totally clear sky, so I knew I had to set up fast. After donning my headlamp and turning off all lights to my vehicle, I jumped out into a hoard of mosquitoes! Good thing I had jeans and a hoodie, because I didn’t bring along bug spray. I took a few test shots to find a proper exposure and figure out how much and where I needed to light paint the scene. I found an exposure of 15 seconds at f 2.8 and ISO 1000 worked really well, and used my Maglite flashlight to add more light on the barn, while using my headlamp to illuminate the foreground grasses. The picture below is the first photo that I light painted enough to be satisfied with. At first, I was kind of annoyed with the power line going to the old barn on the side, and figured, “Well I could just photoshop it out later if I really want to”. But then I started thinking, and I kind of like how it adds to the scene, it helps to show while these buildings are no longer used, are falling apart and being torn down, the aurora is timeless. As long as we still have our sun, the energy from the aurora will be here forever. Who knows how long we will get to see these beautiful prairie icons still standing? I then set up my remote to create a time lapse. This image was captured somewhat in the middle of the timelapse where the aurora action was at it’s strongest. I really liked how the green was reflecting onto the clouds and there is even a little bit of purple above the green in the centre. As I was taking my time lapse images, the clouds kept creeping more and more into the north eastern sky until you could no longer see the lights. At that point I figured I’d quickly pack up and see about heading farther east. After about 5 minutes of driving, I realized it would take at least an hour to get into clear skies again, and because it was already around 1 am , I decided to stop chasing the aurora and instead focus on capturing some lightning photos. 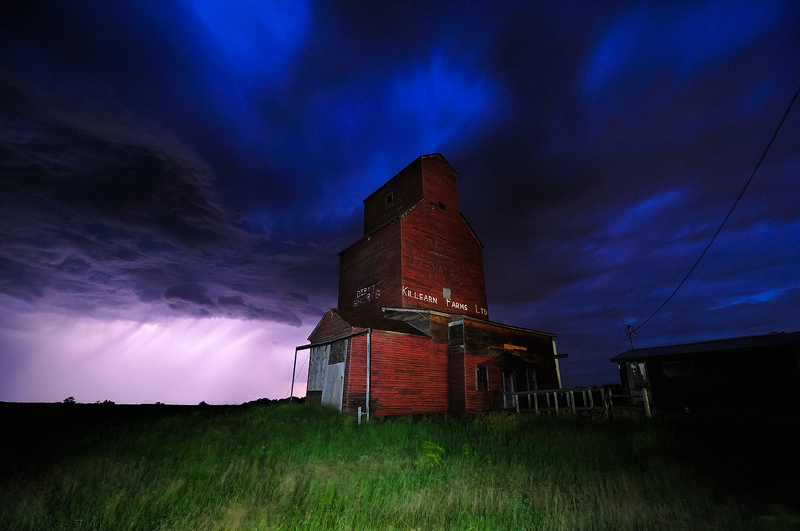 Driving back west towards the storm, I traveled past the grain elevator and eventually onto a Range Road to set up for a big panorama photo filled with lightning. A few test shots later and I realized from that position, there was way too much light pollution from Edmonton and the surrounding areas. The storm was tracking Northeast anyway so I changed my location to face farther north, where I had a clear view of the horizon with no light pollution. 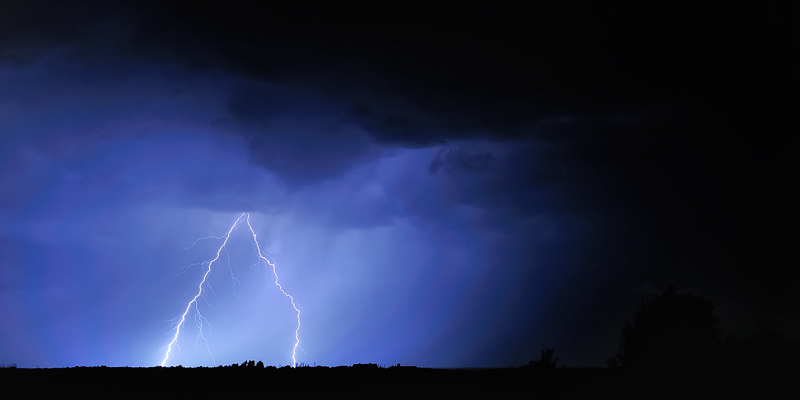 Because I currently do not own a lightning trigger, I set up my camera to ISO 200, F 7.1 and set my camera to bulb mode so that as soon as lightning struck, I could release the shutter. After only 6 seconds during my first photo, the storm produced this beautiful flash. I took a few more attempts but none were as bright as this one, and the raindrops were getting pretty big so I decided to change locations once again. I backtracked a little (heading east) and found a nice open canola field with a perfect view of the light show. I reversed the 4Runner onto an access road to the field, and opened the hatch so I could have my camera set up while not getting wet from the on and off rain. I captured a few small strikes behind the rain wall, but nothing too great until this one. After triggering the shutter with my remote, I had to wait a little longer than 6 seconds as a strike didn’t occur until 30 seconds in. 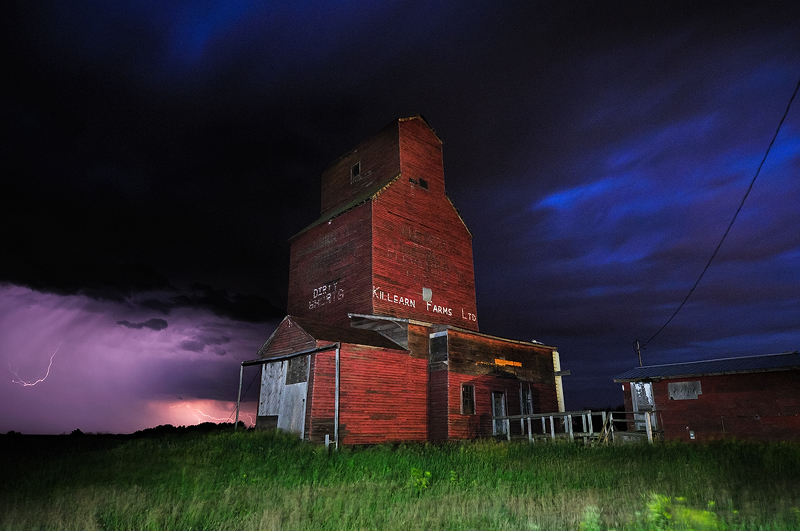 By this time a thought popped into my head, and that was that the storm was probably going to be set up nicely to be able to capture lightning photos behind the old grain elevator. So once again, I packed up and drove a few more kilometres east. By now, it was 3:20 am, and when you are this far north, it starts to get brighter already which gave the sky a nice electric blue colour. I used pretty much the same settings from when I was taking the lightning shots and light painted the barn. The exposure time for this photo was 30 seconds. I took a few more photos from different angles, but not really capturing any more prominent strikes. I did really like this shot though, which illuminated the cloud structure beautifully. These are just a few of the photos I captured during the early morning hours of July 10th. I have a few others to go look at and process, and also have to put together the time lapse (which I am still learning how to do). It sure would be handy to have a navigating partner while I’m chasing aurora or lightning! So what do you guys think, do you have a favorite image from this set? And if so why? Would you remove the power line in the photos or leave it like I did? I’ll leave these questions for you guys to answer in the comment section below! 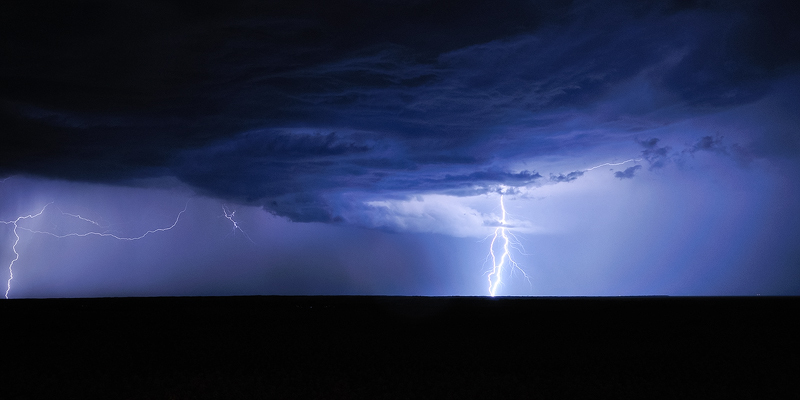 Written by Mike Isaak, posted on July 15, 2013 at 8:50 pm, in Alberta, Aurora, Storm Chasing and tagged alberta, aurora, light painting, lightning, storms. Permalink. RSS feed for this post. « Afternoon to dusk, with Mitre Peak – Milford Sound, New Zealand. WOW love your work , wish i was closer would love to go chasing with you . i am at the AB/SK Border about 3.5 hr from you . thxs for posting your settings been trying to do a little light painting with my aurora photos not much luck yet . but learning more every night that they Dance . Hey thanks Charlene. What town would that be nearby? And no worries, if you have any questions at all about aurora or anything photography related, feel free to ask! I feel there’s value in the contrast the power line offers. Energy harnessed by man vs. wild/natural energy. Prairie Storm really grabs me. All are absolutely wonderful. Ya, I really enjoy that one too. My favorite part of that shot might just be the blues in the sky though, nevermind the lightning! Haha. Mike, Awesome captures and well told. The elevator in these pictures was actually supposed to be the elevator for Ryley. However, Equity, now known as Ryley had already been built in it’s present day location. So, a few name changes and administrative headaches later the town that was supposed to grow up around that elevator was named Shonts. By the way, leave the power lines, and I love the clouds in “Illuminated”. No way, that’s some really cool information! I love how all the old buildings have so many unique stories about them. Good to hear, thanks for stopping by!